John Kahekwa Munihuzi Jean de Dieu was born in 1963 in Miti village near the Kahuzi Biega National Park’s (KBNP) headquarters office. His aunt was the wife of Adrien Deschryver, the co-founder and the first warden of the KBNP. At the age of ten, John watched a film about the Kahuzi Biega gorillas and dreamed of working for the park in the field. In 1983 after attending secondary school he was employed by the park as a gorilla tracker and started to follow two groups of gorillas every day, identifying them by recording nose prints of each gorilla. Eventually, John became KBNP’s chief gorilla tracker from 1983 to 2003. He observed the natural life of gorillas in the wild such as reproduction, newborn babies, development of their society, social interactions and death. He also saw the impacts of human pressures on the natural resources from the local communities around the KBNP. He then sought a sustainable solution that could contribute to the protection of those natural resources while alleviating the crisis impacting the local communities. In 1986, a tourist gave him a $10 tip after a gorilla visit. He immediately went to Bukavu town and bought ten plain t-shirts. He printed gorilla faces on their fronts and beneath wrote, “I tracked gorillas in Zaire.” They were a hit with tourists. In 1987, his t-shirt business increased because part of the famous film ‘Gorillas in the Mist’ was filmed in the KBNP. John played a small part in the film, too. The money he saved from the t-shirt business was the initial funding for the Pole Pole Foundation International, chartered in 1992. 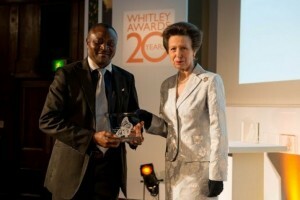 Mr. Kahekwa was presented the Whitley Award from HRH, the Princess Royal. Sir David Attenborough narrates a beautiful film about the Whitley Award which we highly recommend. Watch it by clicking here. In addition to the Whitley Award, John has received several other prestigious awards for his work including the Marsh Award and is a three time recipient of the Medal of Merit for Ecology and Gorilla Protection. Elephant Rescue is a 501 (c) (3) Public Charity. Your donation is tax deductible.